The UK government has published its new nuclear industrial strategy, describing how it aims to help UK companies seize growth opportunities in the global nuclear sector. The strategy covers the whole of the nuclear market, including new build, waste management, decommissioning, fuel cycle services, operations and maintenance. Globally, an estimated £930 billion will be invested in nuclear new build over the next 20 years, with another £250 billion for decommissioning old plant. The new strategy sets out the basis for a long-term partnership between government and industry to exploit those opportunities. It also aims to drive down the costs of electricity generation by reducing technology risks and development costs, and investigating the potential of small modular reactors. The strategy is overseen by the Nuclear Industry Council, created in October 2012 and involving senior figures from industry, research and government. New initiatives include a procurement and infrastructure client group, to launch later this year. Headed by EDF Energy, the Nuclear Decommissioning Authority (NDA) and government, the group will aim to simplify market access for UK suppliers. The government will also support research into access to finance for smaller businesses in the nuclear sector. Inward investment and export agency UKTI will meanwhile work to increase investment for all parts of the nuclear supply chain, and create a new nuclear export strategy. The industrial strategy also commits the government to continued funding for research and development, innovation and skills, including ongoing support for the Nuclear AMRC and other centres. 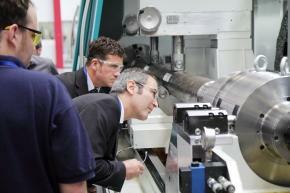 The report highlights the Nuclear AMRC’s research into automated deep-hole drilling technology as a case study of innovative development of commercial manufacturing techniques. Two new bodies will be created this year to support nuclear R&D: the Nuclear Innovation Research Advisory Board will ensure that publicly funded R&D is aligned to industrial and energy policy; while a new Nuclear Innovation Research Office, likely to be based within the National Nuclear Laboratory, will coordinate R&D programmes and advise industry and government on R&D opportunities. Alongside the nuclear industrial strategy, the government has released half a dozen supporting documents including a new review of the UK’s civil nuclear R&D capabilities. The report highlights the importance of coordination between the public and private sectors, including through the Nuclear AMRC. Nuclear Industrial Vision Statement – industry view on opportunities to 2050. Long-term Nuclear Energy Strategy – government view on opportunities to 2050. Civil Nuclear Research and Development Landscape in the UK: a review – assessment of current R&D capabilities. Nuclear Energy Research and Development Roadmap: Future Pathways – identifies R&D to support nuclear power to 2050. Economic Benefit of Improving the UK’s Nuclear Supply Chain Capabilities – analysis of opportunities in the nuclear sector, and the potential to expand UK market share.